Memory objects are meant for scripting control; the first implementation is a MemoryIcon that lets you put a multi-state icon on the screen. MemoryIcon objects work two ways: If a series of icons is defined in the file, the memory contents will be translated via this table (this was the original behavior). If there aren't any icons defined, the memory contents is displayed directly, as a string if it's a String and as a NamedIcon if it's a NamedIcon. See xml/samples/MemoryIconExample.xml for info on how to set this up. The first implementation of Reporter is Digitrax transponding. By adding the appropriate elements to your Panel files, you can show decoder ID information on your Panels. Click the "Add to Panel" button. The Reporter icon will be placed on your Panel. If it's not visible, that might be because the value is currently blank; use the Reporter Table to change the value to something that will be visible. The pop-up menu on the icon will let you change the formatting. See xml/samples/ReporterIconExample.xml for info on how to set this code up by hand. First check that JMRI is seeing the LocoNet messages OK. From the tools menu, open the "Reporter Table". Run a locomotive across your transponding sections, and you should see the arrival and departure status show up on one of the lines in the table. 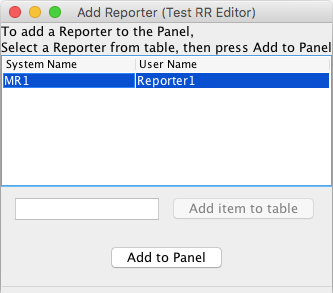 Next, you need to add the "ReporterIcon" that displays this directly to the panel file. Look in the "xml/samples" directory within JMRI for a file called "ReporterIconExample.xml". The "x" and "y" define where you want it on your panel. The "LR12" is the name of the reporter object, e.g. the name of the one you saw changing when you were looking at the table. It's actually not as hard as it sounds.